One of the largest cruise ships in 1985 was the 46,000-ton Carnival Holiday. Ten years ago, the biggest, the Queen Mary 2, was three times as large. Today’s record holders are two 225,000-ton ships whose displacement, a measure of a ship’s weight, is about the same as that of a Nimitz-class aircraft carrier. Cruise ships keep growing bigger, and more popular. The Cruise Lines International Association said that last year its North American cruise line members carried about 17 million passengers, up from seven million in 2000. But the expansion in ship size is worrying safety experts, lawmakers and regulators, who are pushing for more accountability, saying the supersize craze is fraught with potential peril for passengers and crew. “Cruise ships operate in a void from the standpoint of oversight and enforcement,” said James E. Hall, a safety management consultant and the chairman of the National Transportation Safety Board between 1994 and 2001. “The industry has been very fortunate until now. The perils were most visible last year when the Costa Concordia, owned by the Carnival Corporation, which is based in Miami, capsized off the coast of Italy. The accident killed 32 people and revealed fatal lapses in safety and emergency procedures. In February, a fire crippled the Carnival Triumph, stranding thousands without power for four days in the Gulf of Mexico until the ship was towed to shore. 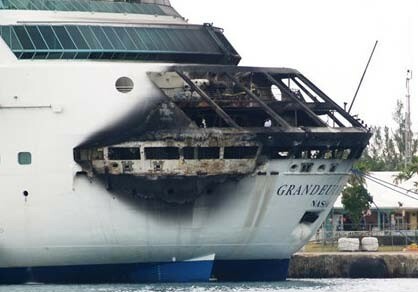 Another blaze forced Royal Caribbean’s Grandeur of the Seas to a port in the Bahamas in May. Pictures showed the ship’s stern blackened by flames and smoke. Although most have not resulted in any casualties, the string of accidents and fires has heightened concerns about the ability of megaships to handle emergencies or large-scale evacuations at sea. Senator John D. Rockefeller IV, Democrat of West Virginia, introduced legislation this summer that would strengthen federal oversight of cruise lines’ safety procedures and consumer protections. Cruise operators point out that bigger ships have more fire safety equipment, and contend they are safer. After a fire aboard the Carnival Splendor three years ago, Carnival adopted new training procedures and added safety features that it says helped with the rapid detection and suppression of the fire on the Triumph. After the Triumph fire, Carnival also announced it would spend $700 million to improve its safety operations, including $300 million on its fleet of 24 Carnival Cruise Lines ships. Carnival is the largest cruise operator, owning about half of all cruise ships worldwide. “We have over time improved the safety of our vessels by better training and better technology and learning from incidents that have happened over the years,” said Mark Jackson, Carnival’s vice president for technical operations, who joined the company in January after 24 years with the Coast Guard. Some experts doubt that ships can grow much larger than the current behemoths, marvels of naval engineering that combine the latest technology and entertainment. Today’s biggest ship, Royal Caribbean’s Allure of the Seas, has 2,706 rooms, 16 decks, 22 restaurants, 20 bars and 10 hot tubs, as well as a shopping mall, a casino, a water park, a half-mile track, a zip line, mini golf and Broadway-style live shows. It can accommodate nearly 6,300 passengers and 2,394 crew members * the equivalent of a small town towering over the clear blue waters of the Caribbean Sea. It measures 1,188 feet long. Its sister ship, the Oasis of the Seas, is two inches shorter. Experts point out that larger ships have larger challenges. For instance, they have fewer options in an emergency, said Michael Bruno, dean of the engineering school at the Stevens Institute of Technology in Hoboken, N.J., and former chairman of the National Research Council’s Marine Board. Left: We all think of the Titanic as a big ocean liner. . . well, at least until we see the below comparison. 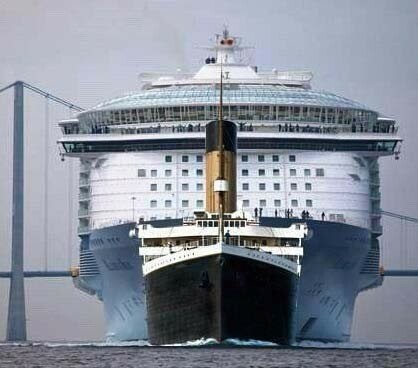 Titanic is in foreground. Allure of the Seas Cruise Ship in background. A recent report by the Coast Guard on the Splendor fire revealed glaring problems with the crew’s firefighting abilities as well as failures in fire safety equipment. The investigation did not address the size of the ship, which carried 3,299 passengers. But it showed that big vessels can quickly become crippled by small fires that disable complex systems. No passengers were hurt, but the damage to the engine room was severe, disabling the ship’s power and forcing it to be towed to port in San Diego. Bud Darr, the senior vice president for technical and regulatory affairs at the Cruise Lines International Association, the industry’s trade group, said today’s ships operated under layers of oversight. The Coast Guard inspects each ship that calls at United States ports at least once a year and enforces national and international norms. Private auditors, hired by cruise operators, perform frequent safety reviews, including comprehensive annual checks that last seven to 10 days, he said, and flag countries like the Bahamas or Panama, where most cruise ships are registered, provide their own oversight. “We are subject to very close scrutiny,” Mr. Darr said. “The standards are universal.” But incidents like the Costa Concordia grounding have raised questions about whether evacuation regulations are still applicable in the age of megaships. Under the Solas regulations, for instance, passengers grouped at their muster stations must be able to evacuate on lifeboats within 30 minutes of an evacuation alarm. The investigation into the Costa Concordia revealed that the crew and its captain failed to sound the general evacuation alarm for more than an hour after rocks had breached the hull. As a result, some lifeboats could not be lowered once the ship started to list. After the accident, cruise operators said they would change muster drill procedures. Instead of holding a drill for passengers within 24 hours of departure, cruise ships said they would do so before ships leave a port. While ships are becoming bigger, the burden on crew members is growing. The Queen Elizabeth 2, which was launched in 1969, had one crew member for about 1.8 passengers. On the Triumph, the ratio was one crew member for every 2.8 passengers. The issue is also complicated by language and communication problems, and a high crew turnover rate that can reach 35 percent a year. The International Transport Workers’ Federation, which represents seafarers and crew members, has expressed concerns about the evacuation time and suggested the need to limit the number of people aboard ships, depending on where they operate and what search-and-rescue facilities are available. Safety rules also state that lifeboats should not carry more than 150 people. But the two largest ships, the Allure of the Seas and the Oasis of the Seas, have much bigger lifeboats, for 370 people, because of a provision of the 2010 rules that allows for exemptions if the cruise line can demonstrate an equivalent level of safety. Those bigger lifeboats have only enough room for passengers. To evacuate the more than 2,300 crew members, the ships are equipped with inflatable rafts that would have to be entered through 59-foot evacuation chutes.